Product prices and availability are accurate as of 2019-04-20 16:29:48 UTC and are subject to change. Any price and availability information displayed on http://www.amazon.com/ at the time of purchase will apply to the purchase of this product. 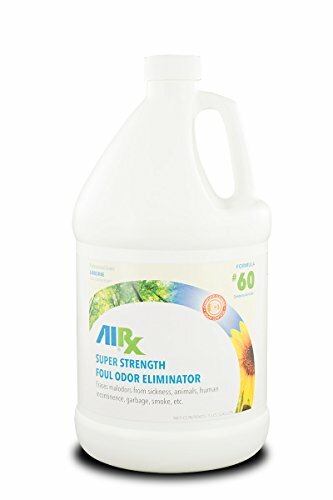 Bullen Airx RX 60 super strength foul odor eliminator is a multi-purpose, broad spectrum water soluble counteractant many times the concentration of ordinary deodorizers, thus effective against stronger, more disagreeable odors for longer residual action. 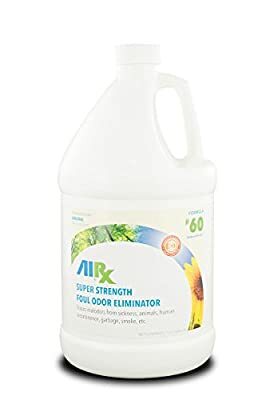 RX 60 is formulated with Airicide odor counteractant to change the "geometries" of odorous molecules in the air so they are not perceived as unpleasant. Just squirt RX 60 on the source of foul odors, or add to cleaning solutions, rug shampoo and rinse water, or dilute with water and use as a space spray. Super concentrate. Counteracts malodors from sickness, human incontinence, animals, pets and pet accidents, sewage, garbage, fats, oils, fermentation, cooking, fire, smoke, cigars, cigarettes, liquor, beer, paint, chemicals, etc. For use in hospitals, nursing homes, institutions, schools, hotels, motels, buses, airplanes, boats. Erases foul odors in bathrooms, locker rooms, kitchens, basements, bed pans, commodes, hampers, air conditioners, etc.